An officer of the law needs to command attention the moment that he sets foot on the scene, and this men leather shirt sends a signal that you're completely in charge. An officer of the law needs to command attention the moment that he sets foot on the scene, and this men leather shirt sends a signal that you're completely in charge. Whether you want to show your authority on the dance floor, at the cosplay event or on the job, this leather shirt is guaranteed to be a perfect fit, as it will be made especially for you in accordance with your sizing instructions. The shirt features classic details that you expect to see in a cop's shirt like snap-down shoulder epaulettes, patch chest pockets with snaps and cuffed short sleeves. Available in seven stylish colours, this short sleeved leather shirt for men has an open front with snap closures for easy on and off. Yesterday I bought shirt with excellent help of staff, Very helpful with our equestriennes, defiantly highly recommended!!! I ordered a shirt online and wasn't sure about the measurements, I emailed on Sunday and was surprised to receive a reply on the Sunday afternoon guiding me. They cancelled my order when they said they had stock in and they gave me some weird excuse and now I have to wait 7 working days for my payment. STAY AWAY I knew this site was too good to be true. Excellent value, easy to use your site!! Amazing service, willing to take calls and emails, expert craftsmanship, and superb attention to detail. This was my first shirt for my brother.We had to wait for the fabric to ship from new york because it was a special run. Great service! Always prompt response for questions and quick delivery. like it! Super slim It is a good size. Came quickly. the quality is good. really hot, does not breathe. size XL 181 cm/kg sat perfectly. the only negative in the area of the armpits bristling several folds. Top quality for a fantastic price, love this shirt!.The order is arrived very quickly. I have respect the table of size, but XL is little too smal however I have respect the description of size. Feels like I am in a real leather and is thin and light weight leather shirt. 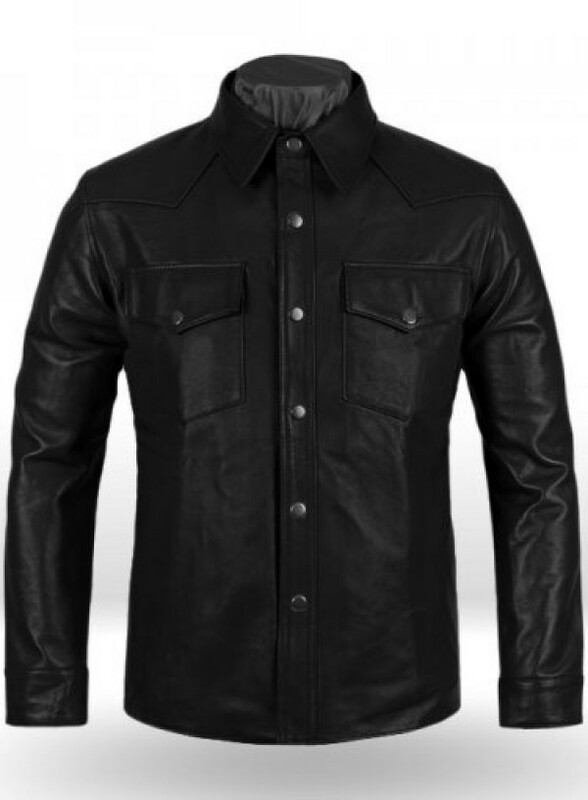 Unlike most real leather shirts that are like a jacket.I really Liked their leather quality, and I got 3 shirts.